2nd Floor Near Elevator - Queen Bed - 2 Twin Beds - Queen Sleeper Sofa -- Beautiful interior, pet friendly condo, neighborhood view! Imagine yourself in this beautiful newly redecorated condo with large 2nd floor balcony. All the amenities you have come to expect and enjoy. Come stay and enjoy private beach access, gated pool and lighted tennis. This is a spacious condo with 920 square feet. Small dog pet friendly. High-speed internet is provided free. Free beach set-ups (2 chairs & umbrella). 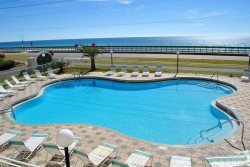 A wonderful Destin vacation condo! Call us or book online today! "Just left 2012 Ciboney. We enjoyed the condo, it was quiet and comfortable! Thanks! Of course the gulf was gorgeous and calm in the mornings as always. Miramar is one of our favorites!" Susan lives in Birmingham, Alabama. Ciboney 2012 is in a desirable location on the second floor of the Ciboney building. Close proximity to both the beautiful pool and the convenient parking makes this property one of our most popular locations. Touting a large private beach along Scenic Gulf Drive, Ciboney graciously welcomes families and couples alike. This property at Ciboney is small dog pet friendly, so you can bring your family doggie with you and enjoy the convenience of the close pet walk and lots of grassy area for walking. This classic beach condo features all tile floors throughout and is decorated in pleasing colors. Of course, the living area takes full advantage of the large balcony and easy going environment where you can enjoy the salt air blowing gently off the Gulf waters. A glass round table and 4 chairs welcome you to relax and take in the beauty and surroundings, while sipping a glass of your favorite beverage, or playing a round of cards with your fellow travelers. A spacious master bedroom hosts a pillow-top queen bed, a tub/shower bath, and private sliding glass door access to the balcony. Just grab your water bottle and new novel to read, and walk to your complimentary beach setup waiting for you on the sand (during season March - October). Be sure to thank the beach attendant, for having them ready for your enjoyment! The guest bedroom offers two twin beds and a second bath makes the stay more convenient for everyone. A TV in every room allows evening entertainment while winding down from a sunny day at the beach or the beautiful pool. The sleeper in the living room allows for 2 extra guests. Enjoy your free beach setups (2 chairs/1 umbrella) every day of your stay. No need to drag furniture to the beach -- just tell the beach attendant where you are staying, and he will set you up! Ciboney also offers newly surfaced tennis courts, lighted for your convenience. So bring your racquet and tennis balls, or watch others compete on the smooth playing surface. It’s first come, first ‘serve’ for guests and owners. When you feel like getting out and discovering all that the Emerald Coast has to offer, you’ll find that destination shopping is just a couple of miles away. Visit Silver Sands Outlet Mall to the east and Destin Commons located just to the west of Ciboney. Getting hungry? Be sure to check out the seafood nearby, at Captain Dave’s, Pompano Joe’s and the Whale’s Tail, all beach restaurants located nearby on the beach road. Book your stay at Ciboney 2012 now by clicking the online booking button above. Then, return every year for your annual beach vacation to this wonderful property! Lighted tennis courts, absolutely free! McKenzie who stayed at Ciboney 2012 said "My mom, her best friends and I went down for a girls trip! We had a blast! The location is great and the walk to the beach isnt bad at all! We loved having the free beach chair and umbrella as well! Definitely worth a stay!" Loved the place. Had everything you needed to feel as if you were home. Great location, nice and clean. Very peaceful neighborhood. The walk to beach was perfect and walking distance to beach store. Family would stay here again.